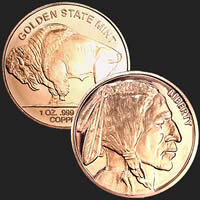 The Don't Tread on My Copper Round for Tea Partiers by Golden State Mint contains 1 Avoirdupois Ounce of fine Copper. 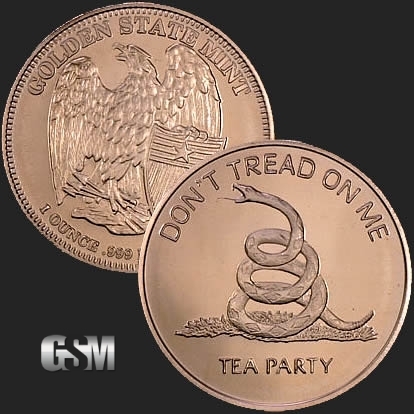 Make a statement with the Don't Tread on Me copper round for Tea Partiers. 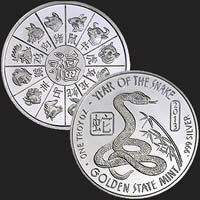 The obverse (front) shows this proud emblem of a serpent coiled and ready to strike out at any person who attempts to challenge rigidly held beliefs. The back side shows the brave picture of an eagle perched and ready to spread its wings with the words "Golden State Mint" emblazoned above this proud bird. 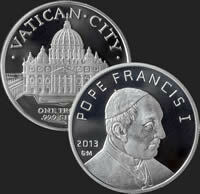 This copper rounds size of 1 oz .999 fine copper for easy trading. If you liked this product, you should check out our 1 oz Copper Second Amendment, 1 oz Copper Statue of Liberty, and 1/2 oz Copper Mercury Dime.